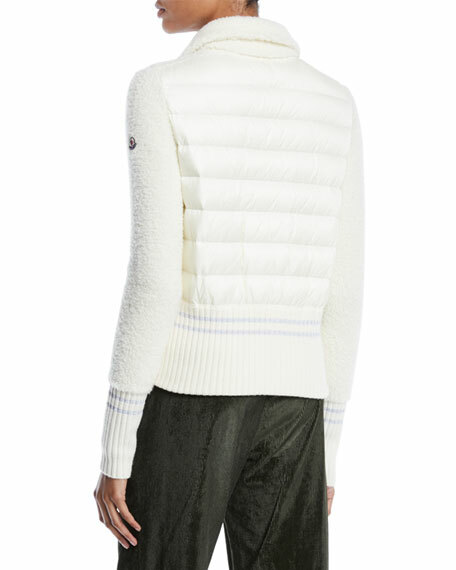 Moncler tricot knit zip-up cardigan. Long sleeves; ribbed cuffs and hem. 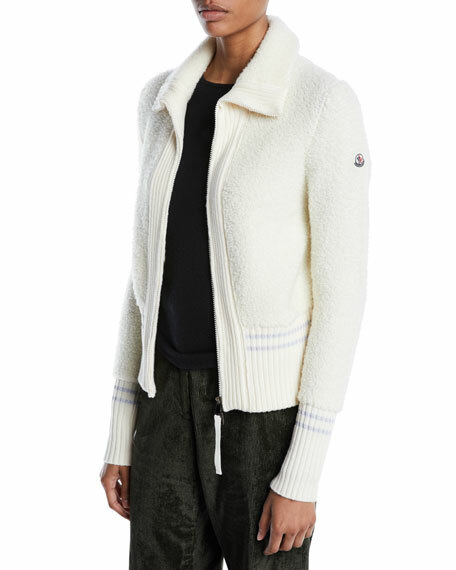 Brunello Cucinelli cardigan in chunky knit with sewn in sequin details. V neckline; open front. Long sleeves. Leather belt cinches waist. Semi-fitted. Hem hits under hips. Mohair/wool/viscose/nylon/polyester. Made in Italy. Model's measurements: Height 5'11"/180cm, bust 32"/81cm, waist 25"/64cm, hips 35.5"/90cm, dress size US 0/2. Kobi Halperin "Leyla" cardigan sweater in merino wool knit with sequin details. Scalloped-edge open-front. Long sleeves; ribbed cuffs. Relaxed silhouette. Kobi Halperin "Leyla" cardigan sweater in merino wool knit with sequin details. Scalloped-edge open-front. Long sleeves; ribbed cuffs. Relaxed silhouette. Banded rib-knit hem. Fine merino wool. Dry clean. Imported. Model's measurements: Height 5'10"/177cm, bust 33"/84cm, waist 25.6"/65.2cm, hips 35.8"/91cm, dress size US 2-4/FR 34-36.